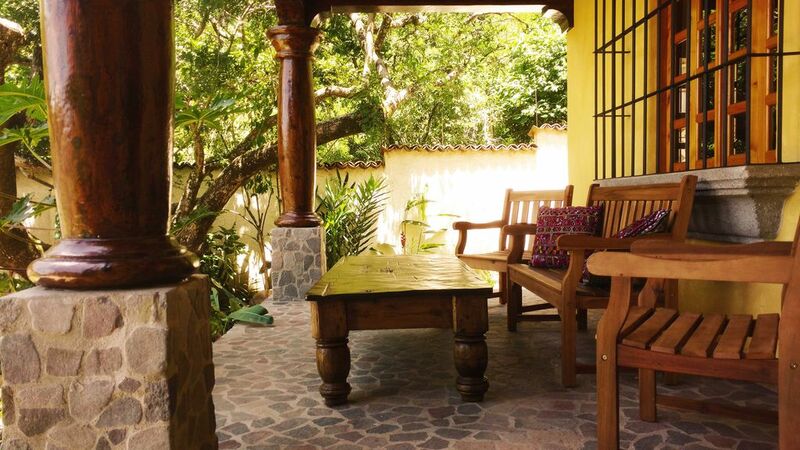 Casa Tula is located in a sparsely developed residential neighborhood and is just a short walk to the lake, main road, and everything in town. We've recently added a secure parking area close to the house. I think it's perfectly located which is why I built the house I live in beside Casa Tula 18 years ago. Back in the 90's I could have bought land anywhere, including right on the lake, but I chose this spot because this lush valley is quiet, way more private, and has stunningly framed views. I own all of the surrounding properties of Casa Tula so it will never be over-developed. Living too close or within the commercial areas (closer to the lake) can be loud (bars, restaurants and parties) and windy because those areas are less protected. As for the house, it's a Spanish style beauty designed by my Son-In-Law and I, and built by myself and my crew. The house is named after my first grand-daughter and she may even grow old in it one day. I've built a few houses in San Marcos over the years but I have to say this is my favorite- I got a chance to refine the details and motifs that I've developed over decades. One of the details I love is the terrazo español, terra cotta ceilings supported by hardwood beams. Fine finishes like stone, tile, hardwood, terra cotta and architectural details accent all the spaces. I've always used sacred geometry in my designs but this time the golden ratio is embedded in the floor plan, windows, and even the custom furniture (check out the mirror in the foyer in the photos). The rooms were planned using Feng Shui principles and furnished with imported carpets and furniture which all contribute to a fine atmosphere. The word 'paradise' has Persian roots meaning walled garden which is clearly expressed at Casa Tula. The downstairs living areas face the courtyard and fountain which invite meditation, quiet mornings or festive dinner parties. The spacious kitchen with modern appliances is made for sharing food and making memories. The large bedrooms upstairs open up to private terraces with incredible views of volcanoes, sunrises and sunsets. When you arrive you'll be greeted my me or my Guatemalan son Ludwin. I have all the local connections guests need for a short or long stay and an authentic Guatemalan experience. My life is filled with my local family, laughter, music, and beauty and I would love for you to come experience the lifestyle at Casa Tula. I'm a full time resident of San Marcos La Laguna for more than 20 years now. I'm a traveling blues musician that would much rather stay home. I'm married to a Guatemalan woman, Catarina, and have a son, Ludwin and a granddaughter, Mimae. Casa Tula is the final piece in my twenty plus years of building here. It's quiet location with easy access and secure parking nearby, make it the perfect private paradise. I have been here for more than 20 years and know the town and most of it's people. We had a great experience at Casa Gila. The house was beautiful and very clean. Carlos our host was amazing! He greeted us upon arrival and saw us at departure. He helped us out with anything we needed and advised us on the local sites. We would definately stay here again and recommend it to all. We had a wonderful four days/nights in this beautiful house, built with care and love by Carlos (who by the way is the consummate host and an accomplished blues-man, who you can hear at his nearby restaurant and blues club, Blind Lemon’s!). The spaces, the design, the light, the details all add up to a unique and remarkable house with a stunning view of a stunning lake. Every room is incredibly comfortable (great bed in the master bedroom) and the overall feel of the house is a delight for the senses. The kitchen is a dream, the outdoor areas are private yet with great views, the bedrooms are spacious, and the bathroom has it all. The house is a true visual delight, but it’s also totally functional and practical for either short or long term stays. Turn on the garden fountain, kick back on the large verendah, and soak in the sights of the most beautiful lake in the world! By far the best experience we've ever had with a vacation home service (and we've had great experiences)! Carlos and family have created a gem of a home and it's obvious that a lot of love and care were put into the building and maintenance of the property. Prior to booking, Carlos was quick to help out with a couple questions and provided us with everything we needed to arrive safely to the little town. Upon arrival, we were greeted by Ludwin and he showed us the trail that leads up to the house. It's a small hike, but definitely worth the trouble to get just far enough out of town to feel completely surrounded by a beautiful garden and wooded area. When we entered the house, I was blown away by the high quality construction and the beautiful, artistic touches throughout. Don't even get me started on the view of Lago Atitlán from the upstairs balcony! Absolutely stunning. The beds are really comfortable and the bathroom has great fixtures and hot water (not always easy to find in Guatemala). The kitchen is really big and has everything you could possibly need. We were even able to get a load of laundry done, thanks to the modern washer machine and covered area to hang dry clothes. A quick stroll into town and we were overwhelmed by all of the choices of restaurants, bars, fresh produce markets, and plenty of convenient little general stores. If you have the chance to explore, you'll really enjoy San Marcos and all of its hippie charm. I can't say enough good about our stay. Thank you, Carlos, Rebecca, Ludwin, and the whole family, for a beautiful time at your home. We'll never forget it! Carlos‘ house is fantastic. The house is beautiful and huge with all kind of amenities. The view is terrific. Carlos is very reactive and helpful. San Marcos is definitely the best location at lake Atitlan with a lot of cachet and authenticity.